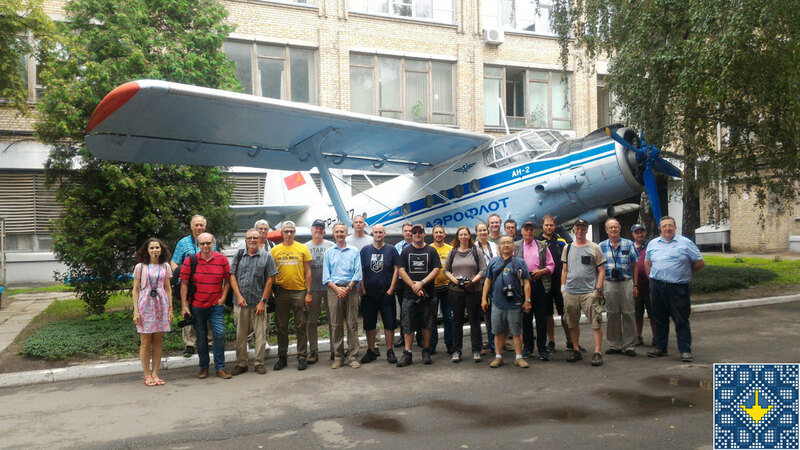 Ukraine Grand Aviation Tour is for aviation fans, pilots and spotters who want to take part in Ukraine aviation tour and look at historical airplanes and helicopters of Kiev, Zaporizhia, Khariv, Poltava, Kropyvnytskyi, Kryvyi Rih. 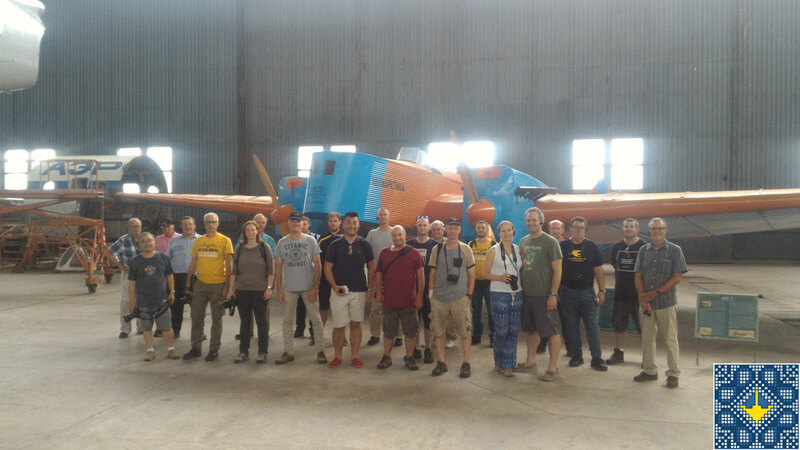 You spend 4 days and 3 nights flying twin engine aircraft Piper PA-32R Saratoga (3 passengers), King Air 350 (7 passengers), An-2 (11 passengers), helicopter Mi-2 / MSB-2 (5 passengers), Yak-40 (26 passengers) or An-74 (50 passengers), visit top aviation museums like Antonov Plant Museums, Ukraine State Aviation Museum, Museum Aviation Training Hangar, Boguslaev Museum of Technology, Kharkiv Aviation Plant Museum, Poltava Museum of Long-Range and Strategic Aviation, Kropyvnytskyi Flight Academy Museum and Kryvyi Rih Aviation Museum, look at unique aircrafts with possibility to visit cockpits and make a lot of pictures and videos. You are welcome to Ukraine! 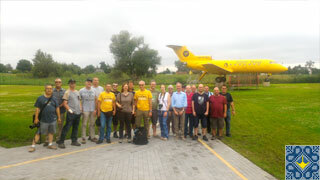 Ukraine Tour "Grand Aviation Tour"
Early morning transfer from Kiev to Yellow Plane Restaurant (Yak-40) for coffee. 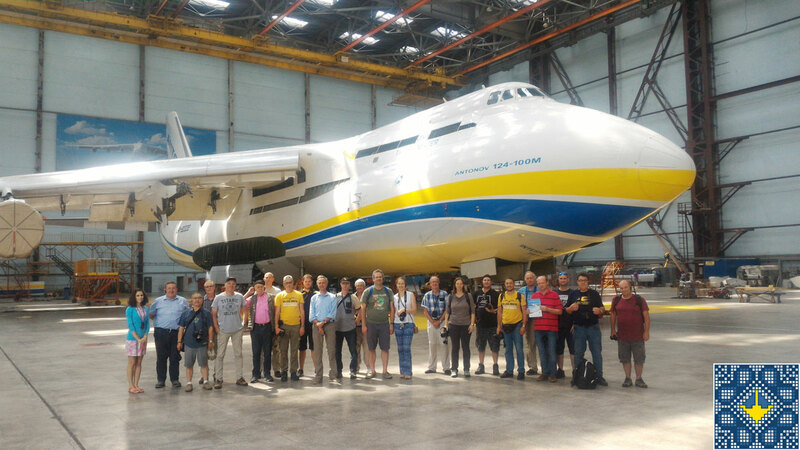 Next transfer to Antonov-2 Airport (Hostomel Airport, GML) to start Antonov Factory Tour and look at aircrafts An-225 Mriya, An-124 Ruslan, An-22 Antei, An-178, An-158, An-148, An-140, An-28 (as Antonov Airlines is active airline and the priority for them is air freight transportation - their aircrafts are shown by availability only). Next drive to Antonov-1 Airport to visit the sister of the largest airplane in the world - An-225 Mriya II, Aircraft Assembly Hangar of An-158, Antonov Flight Simulators Center to look at flight simulators An-148, An-70, An-124 and the first analog flight simulator with small airplane on which installed camera flying over reduced scale aerodrome layout. Lunch at Antonov Dining Room. Next visit People's Museum of Antonov Plant and Memorial Cabinet of Aircraft Designer Oleg Antonov. 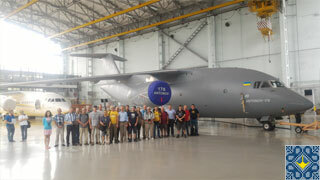 Group picture in front of aircraft An-2 - the biggest success of Oleg Antonov. Then visit of Kiev Museum Aviation Training Hangar for Tupolev ANT-7 (in case of individual and small group aviation tour - optional flight training on flight simulator Tu-134A, Tupolev TU-154 Careless or Boeing 737). 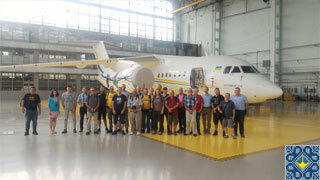 Next visit Ukraine State Aviation Museum to look at the largest aviation museum of Ukraine. Transfer to Kyiv International Airport (Zhuliany, IEV) for regular flight Kiev - Zaporizhia by An-24 (An-140, An-74) with light dinner (lunch box) during the flight. On arrival in Zaporizhia International Airport (OZH) transfer to the hotel. Night in hotel. Departure from hotel by private van to Motor Sich Plant and if it will be possible and get the permit - there is a chance to visit flight simulators of Mi-2, Mi-8 and even Mi-24. 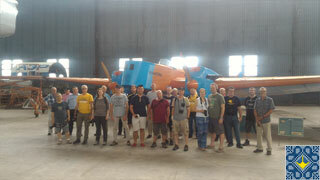 Next transfer to Boguslaev Museum of Technology for aircraft and helicopter engines guided tour. Lunch at Motor Sich Dining Room. Transfer to Moto Sich Heliport. Next by helicopter Mi-2 / MSB-2 (5 passengers), aircraft Piper PA-32R Saratoga (3 passengers), King Air 350 (7 passengers) or An-2 (11 passengers) fly by route: Motorsich Heliport - Il-76 (31 aircrafts) - South of Zaporizhzhia City - Khortisya Island - DniproGES - Shiroke Airfield with landing - Motorsich Heliport. Shiroke Airfield Ramp Tour of 58 Let L-29, 13 Antonov An-2, 9 Mil Mi-2. 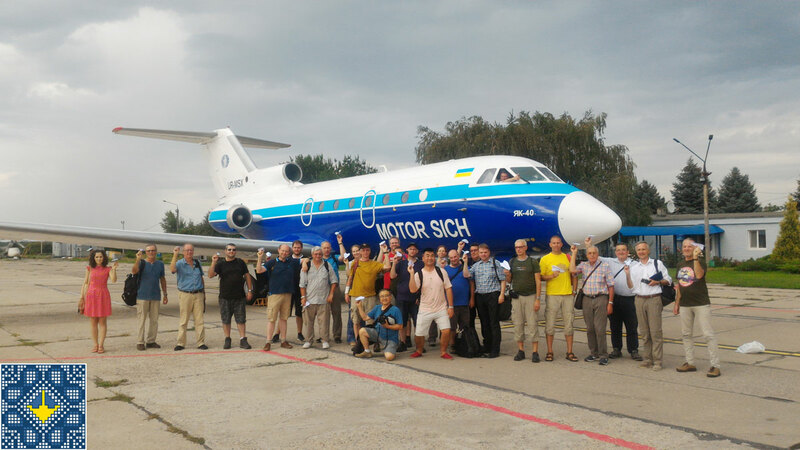 Fly back to Motorsich Heliport and then make ramp tour of aircrafts of Motorsich Airlines - An-12, An-74, An-24, An-140 (aircrafts are shown by availability only) and watching movie about the history of Motor Sich Company. Transfer to European restaurant of Hotel "Intourist" for tasty dinner. Night in hotel. Transfer from the hotel by private car to Motorsich Heliport. Flight by helicopter Mi-2 / MSB-2 (5 passengers), aircraft Piper PA-32R Saratoga (3 passengers), King Air 350 (7 passengers), An-2 (11 passengers), Yak-40 (26 passengers) or An-74 (50 passengers) to Kharkiv Aviation Plant with landing on the airfield of the plant and visit Kharkiv Aviation Plant Museum with exposition under the sky of aircrafts Tu-104A (cosmonaut Yuri Gagarin had training by that aircraft for weightless simulation), Tu-124 and Tu-134. 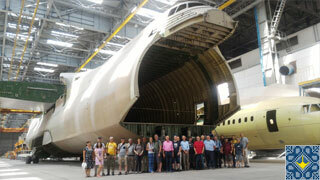 Next visit Aircraft Assembly Hangar of An-74. Next from Kharkiv Aviation Plant take-off to Poltava International Airport (PLV). 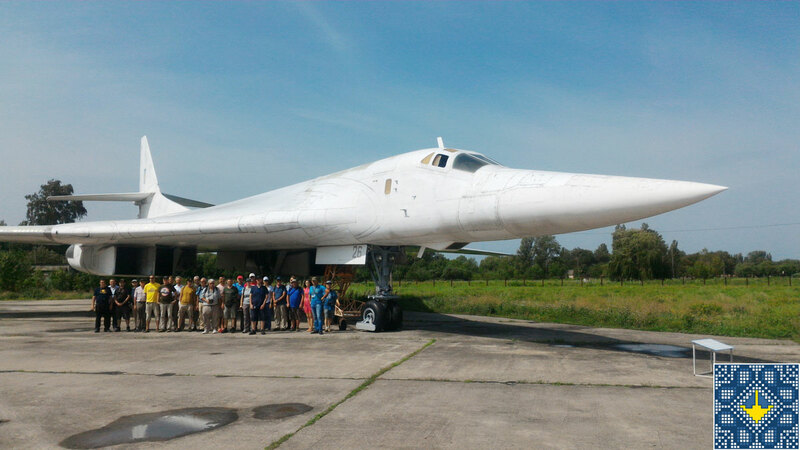 Transfer to Museum of Long-Range and Strategic Aviation with ramp tour of Tu-160 White Swan (one in the world in museums), Tu-95MS, Tu-22M3, Tu-22K, Tu-16, Tu-134UBL (in case of charter flight by helicopter Mi-2 / MSB-2 - optional helicopter tour to Konotop Aviation Museum for Mi-22 - Mi-6AYa airborne command post). Flight to Kropyvnytskyi Airport (KGO). On arrival - ramp tour of helicopters and aircrafts IL-78 (the first prototype), pink Yak-40, Mil Mi-2, An-2, L-410, An-24, An-26 with possibility to visit cockpits of some of them and Kropyvnytskyi Flight School Hangar with lights aircrafts which use for students who learn to fly. Next visit URGA Airlines aircrafts An-24, An-26 and Saab340B. Transfer to Flight Academy of National Aviation University. Lunch in Flight Academy Dining Room. Visit Aviation Museum anf then Flight Simulators Center to look flight simulators of L-410 and An-26 (optional activity - to fly each one or just one of them for 30 minutes). Next transfer to Aviators Alley with Aircraft-Museum An-24, unique and only one in Ukraine jet bomber Ilyushin Il-28, Yak-40 with sign "Donbass" of former Kirovograd Airlines, Mig-21 and put some coins in famous nest hat "Starling Box Forever" for luck and safe flights. Flight to Kryvyi Rih International Airport (KWG). Transfer to Kryvyi Rih Aviation Museum. Ramp tour of aircraft Tupolev Tu-114 and other Soviet aircrafts and helicopters - TU-154, TU-134, Yak-42, An-12, Mi-8 (in case of individual or small group tour - flight by Flight Simulator of Antonov An-2). Next flight back to Zaporizhia International Airport (OZH). Night in hotel. Early morning transfer from the hotel by private car to Zaporizhia International Airport (OZH) for regular flight Zaporizhia - Kiev by An-24 (An-140, An-74). On arrival in Kiev transfer to Bila Tserkva Cargo Aviation Complex and Bila Tserkva Air Club "Pilot" named after Pavel Popovich with ramp tour of aircrafts Il-76, An-12, An-2 (with Oleg Antonov portrait on the fuselage), helicopter Ka-26 (only flying Ka-26 in Ukraine) and other aircrafts that will be available on the ramp. 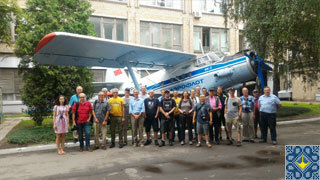 Optional flights during 15 or 30 minutes by Antonov An-2 (6 passengers) and helicopter Ka-26 (6 passengers). Lunch at restaurant in Bila Tserkva. Next transfer to aircraft-monument Tupolev Tu-16 near Bila Tserkva Airport. On back way to Kiev visit Airfield Kiev-South - guided tour of hangars (helicopters Ka-32, Mi-8 and other aircrafts), aviation bar-museum and helicopter-monument of Ka-26. Optional flights during 15 or 30 minutes by only one in Ukraine Antonov An-3T with 12 passenger seats. Drive to Kiev hotel, Igor Sikorsky Kyiv International Airport (Zhuliany) (IEV) or Boryspil International Airport (KBP). 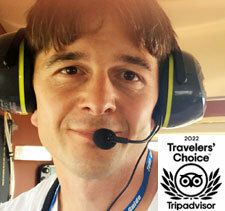 This of next day optional Chernobyl helicopter tour (90 minutes) or Kiev helicopter tour (30 minutes). 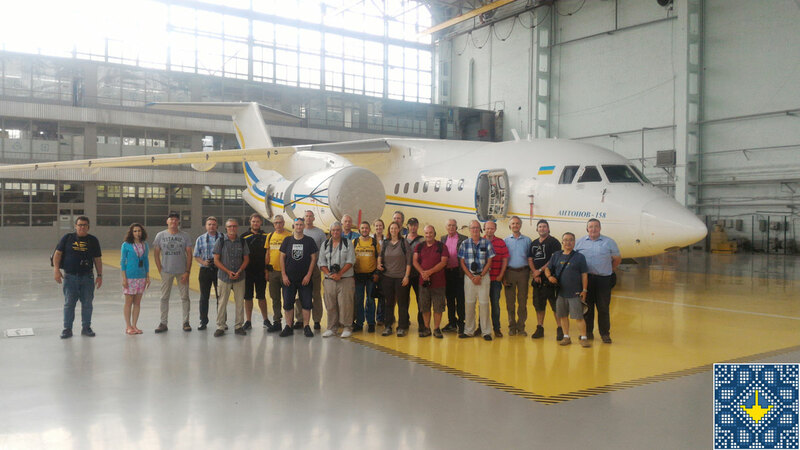 Also if you fly to Ukraine by your own airplane or helicopter - we could organize Ukraine Grand Aviation Tour individually and by your own aircraft.